As has been pointed out after every mention of Stephen King’s Under The Dome—and with it, the upcoming CBS series based on same—the whole “trapping a town under a giant transparent dome” thing is one of many, many stories The Simpsons did first. Of course, in this case, “Simpsons did it” only on a technicality: King began working on Under The Dome in 1976, only to see The Simpsons Movie spin the concept into comedy in 2007—two years before King finally published his book. 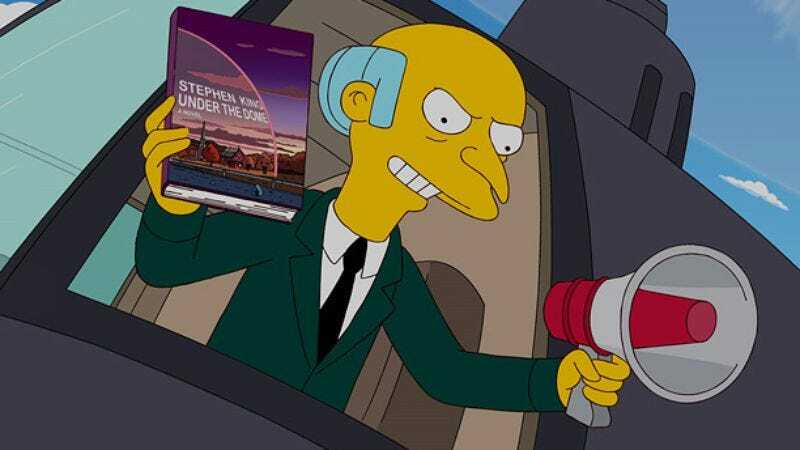 The Simpsons itself already made playful reference to the similarity with an episode in which Mr. Burns, somehow holding a copy of King’s enormous novel aloft with his feeble arms, threatens to trap Springfield under a dome before realizing it’s already been done. And now the CBS series aims to repay the favor, with showrunner Neal Baer telling Entertainment Weekly that the third episode features a party scene where some of the kids are watching The Simpsons Movie—a “verbal reference” that doesn’t include actual footage, but still. The acknowledgment should be enough to end this discussion, so you can move on to appreciating Under The Dome’s otherwise totally original elements, such as its many spider-pigs.